In the Summer of 2018 CNMAT was awarded a grant to construct infrastructure for producing mobile, multi-channel concert events. We set out to construct a surround audio system, designed with robust mobility in mind, that can be rapidly deployed in numerous performance contexts. The result is the CNMAT Mobile Array, an expandable mobile infrastructure for sonic events. The system is conceived to be deployed in under an hour by a small crew of one or two people. Its speaker elements are weather protected to enable work outdoors and we have included a number of flexible rigging options to support work in various new music and theater contexts. In its initial form the CNMAT Mobile Array consists of 8 Meyer Sound UP4-XP loudspeakers, 1 Meyer Sound LFC-750 Subwoofer, 1 Meyer MPS-488Hp, & 1 Meyer Galileo Galaxy Processor with associated casing and rigging. However, the system has been designed to be scalable in 8-channel increments so that we can expand it in later installments to better support Wave Field Synthesis (WFS) and Higher Order Ambisonic (HOA) configurations. 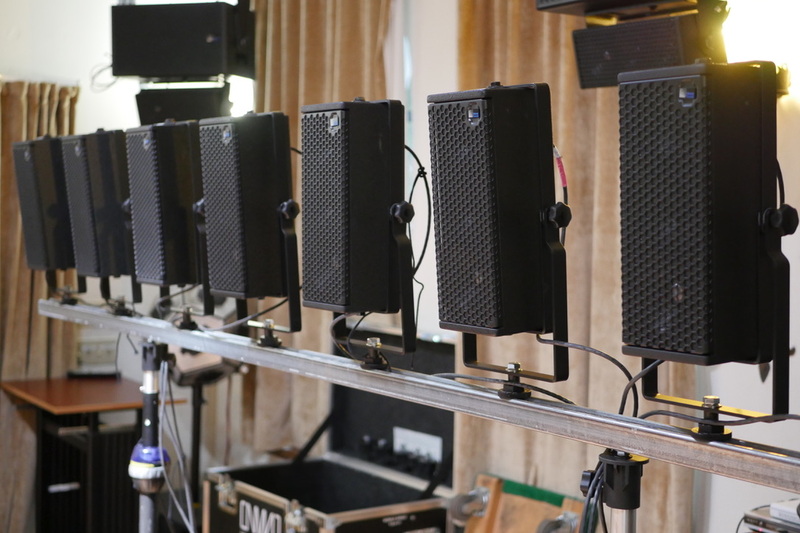 The CNMAT Mobile Array has already been pressed into service in support of CNMAT main room events including use as a cubic array for this Fall's Reidmeister Move concert. The system's modularity has proven a valuable research and demonstration platform for emerging network audio applications & audio spatialization techniques. In the coming months we will deploy the system in support of various CNMAT-supported events including a "Sound Garden" demonstration as part of the annual Cal Day on April 13. This project is made possible through the grant support of the UC Berkeley Student Technology Fee with generous in-kind support of Meyer Sound.